The Kreyòl language has the imagination of a child: limitless. It paints everything vividly, musically and is full of emotion. It holds nothing back. After a great introduction by Wynnie Lamour, Director of the Haitian Creole Language Institute, the evening of inspired music and poetry began with Andeyò: Drums & Chants from Rural Haiti with master drummers Jean Raymond “Sanba Kebyesou” Giglio, Zilibo, Markus Schwartz, and vocalist Geralda Dalestin. A fitting and educational drumming set that took the HCX community back in time, to a period where Kreyòl was being brought to existence by the different African tribes transported to the island. Introducing each song with its historical background, the group taught us about the various rhythms so prominent in traditional Haitian music: Rada, Nago, Kongo and Banda. The poets took the stage next. Delianov and Melissa Beauvery shook us with their readings of “M’ Gen Yon Kanmarad”, “Loray Kale” and some of their own writing. Schneider Laurent, with his own mash up of Franketienne, Georges Castera, Felix Morisseau Leroy, and many more, had us at the edge of our seats with a breathtaking theatrical performance. The emotional intensity only escalated from there as pioneer of Kreyòl writing, poetry and literature, Jean Pierre Richard Narcisse came to the stage. He read a series of texts from the great Haitian poets and some of his own that extensively and intimately explored the various forms of basic emotions of human nature: anger, sadness, happiness… He then invited his wife and her endearing voice, Jasmine Narcisse, on stage to sing “Nan Katye Moren“ in accompaniment before ending his set in a powerful reading of an excerpt of his collection “Recho etajè : Pa mande m’ poukisa m’bèt“. The latter had our hearts in our throats and holding back tears. The night ended on a melodious note with Pauline Jean and her band taking on beautiful, jazzy renditions of some of Haiti’s iconic tunes. Leaving the Shapeshifter Lab was a struggle, as we didn’t want her set to end. Thank you to all that made this event as wonderful as it was and we can’t wait to bring you another event filled with what, in our opinion, runs through the veins of the world: art, rhythm and culture. Thank you to our funders: ConEd, National Endowment for the Arts, the Department of Cultural Affairs and the New York State Council on the Arts. In collaboration with the Prospect Heights Music & Arts Festival, Sunday, July 19th at the Way Station, Taïna Cérat Ligondé took us away on a short but charming musical journey. For an hour, in the heat of the New York summer, we were transported to a land completely her own with various renditions of jazz music infused by the soul of Haitian rhythms and folks songs. 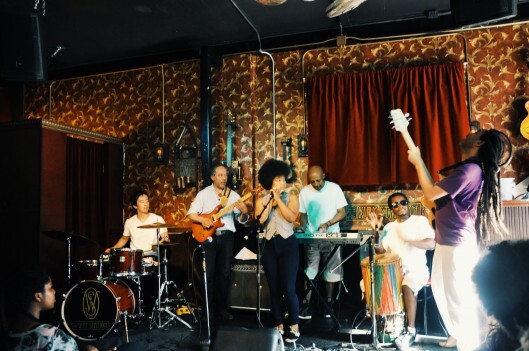 Her warm voice accompanied by the exhilarating sounds of Alegba’s bass and his lively, talented band filled the small bar for our first installment of Mizik Ayiti! in Prospect Heights, Brooklyn. The set ended with a beautiful rendition of the ever favorite “Kote Moun Yo” sending everyone out in a dancing mood and lightheartedness. We thank all who attended this event and look forward to seeing you on August 22nd for Pwezi ak Mizik Anba Tonèl at the Shapeshifter Lab for an evening of poetry and music. A special thank you to the funders of Mizik Ayiti! : Con Edison, National Endowment for the arts, The Department of Cultural Affairs & New York State Council on the Arts. HCX held its 4th annual Pwezi ak Mizik Anba Tonèl on Saturday, August 23rd at FiveMyles Gallery. 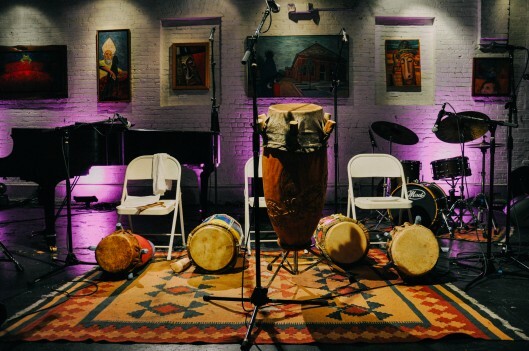 This annual performance has emerged as a seminal community event — one that has hosted renowned writers Syto Cavé and Anthony Phelps, Master Drummer Frisner Augustin, as well as emerging talents Melissa Beauvery and Riva Precil. Traditionally held outdoors, the rain forced us inside but could not dim the energy in the room that evening. Catered by Cybille St. Aude, guests were offered delicious tastes of soup joumou, chicken skewers and pen patat while they mingled and shopped at the HCX Boutik. Once everyone settled in, Shirley Skai and her band kicked off the night by presenting a mix of Haitian classics as well as some original songs. Her covers of Lauryn Hill’s song Ex-Factor and BeLO’s Lakou Trankil had the audience singing along, enthralled by Shirley’s beautiful voice and presence. Jean Dany Joachim followed Shirley with a set of poems that were at times sober, and at others, passionate. One poem was dedicated to the chaos of the 2010 earthquake and the pain that has lingered in the hearts of victims and Haitians abroad. Jean Dany’s two year old son was also a highlight of the performance, joining his father on the mic. Francie Latour offered us readings by René Philoctete and Michel-Ange Hyppolite. With a refreshing voice, Francie was able to hook the audience in as she read imagery-filled stories of raising her children in suburban Massachusetts. M’pa janm mande-m poukiasa m’ret isit? Sa k’ fè m’ pale jan m’ pale ya ? Do I ever ask myself why I live here ? Or Speak the way I speak? Excerpt from Open Gate, An Anthology of Haitian Creole Poetry. Before reading his pieces, Marc Anthony Arena spoke of Paul Laraque, his grandfather, as an influence on his poetry. Marc also read about themes relating to the earthquake with raw and genuine emotion. After the rain settled, the last performance was moved outside, where a rosebush by artist Sam Tufnell bathed the musicians in a mystical purple glow. Tiga Jean Baptiste’s set encouraged people passing by to stop and join the audience, taking in the beautiful sounds of Tiga’s skill. The didgeridoo, mbira, bass and guitar complimented his soothing and mellow performance. This year’s Pwezi ak Mizik event was dedicated to our friend Mario Donnay who resided on St. John’s Place and passed away earlier this year. Special thanks to the performers, audience members, and HCX volunteers! Jean Dany’s books of poetry can be bought at the HCX Boutik. Manman Zanfan by Denizé Lauture, a project of the Arena family for alphabetization in Haiti, is also available for sale. Check out some PHOTOS and VIDEOS from the event and share this post with your friends. See you at the next HCX event! 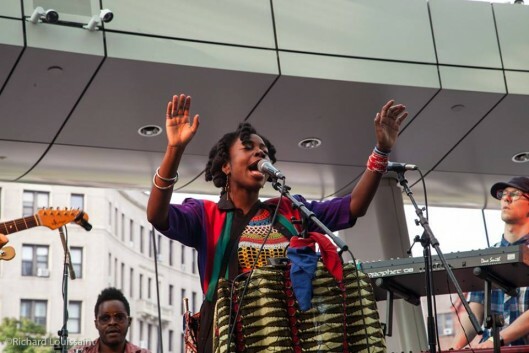 Collaborating with the Brooklyn Museum on August 2nd as a part of their Target First Saturdays Series, vocalist Melanie Charles was the center of attention for an audience of over 300 people of all ages and with an interest in Haiti and Afro-Caribbean culture. Charles’ soulful voice and equally gifted band, Rat Habitat, vibed with the packed lobby, and excited the children who danced right in front of the stage. Unmistakable in her set was her Haitian pride, noticeably tying the nation’s flag to her microphone stand and speaking and singing in Kreyòl. Leading the engaged crowd in reciting the words “Sa Fè La Pèn” (that makes me sad), Charles took the audience on an emotionally beautiful ride, as the song tells the story of a mother who recently lost her child. Toward the end of her set, the vocalist brought out guest performers, including Haitian-American and Brooklyn based MC, Farrah Burns, as well as Tiga Jean-Baptiste, a Haitian-born multi-talented instrumentalist performing on the didgeridoo. The Mizik Ayiti! 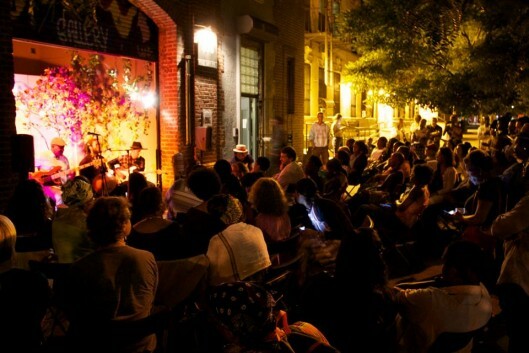 Summer Concert Series is an ongoing effort by Haiti Cultural Exchange to bring emerging musicians of Haitian descent to the forefront of the New York City performing arts scene. We thank the Brooklyn Museum for this ongoing collaboration and look forward to seeing you at our next Mizik Ayiti! event on Saturday, August 23rd! Continue to visit www.haiticulturalx.org for information on future events and check out some of the photos, courtesy of Richard Louissaint, HERE.